Building communities of care creates a culture of compassion and accountability, inspiring you to be the best version of yourself. Self-care is not a lone pursuit. Having someone you can reach out to when you need an extra push or a compassionate ear can very well be the difference between burning out or becoming your most powerful self. Today we’re going to explore how we can build powerful communities of care. Throughout history, our greatest cultural shifts and positive leaps have been born from a place of collectivism. The idea that “united we are stronger” has been proven time and time again. But what about the idea that together we are “healthier”? What about the argument that bonding with our peers brings us comfort in trying times? What about the possibility that a strong community helps all its members achieve physical and mental wellbeing? I argue this is what happens when we build communities of care. Rather than being islands unto yourself, accepting and relying on the help of others builds a sense of accountability to your community, inspiring you to be the best version of yourself. This is not dependency. This doesn’t devalue your contributions or render you an incapable human being. Being part of a community you genuinely believe in is both empowering and humbling. It’s at once calming and energizing. It’s striking that healthy balance between “me” and “we” that’s the key to emotional and physical health and well-being. Why Create a Community of Care? Think of a standard rope. It starts out as a bunch of frail individual strings. However, when they are all intertwined, the result is an unbreakable force. When you build a community of care, you immediately become stronger. You are instantly blessed with greater power to take on the problems you deem worthwhile. Think about it, you go from a single voice for change to a chorus for change and that’s a powerful thing. It’s only possible because a community of care looks out for itself. A community of care doesn’t merely ask a single mother how she and her children are doing. It finds ways to help with childcare and babysitting. A community of care doesn’t expect a teacher on strike to hang in there alone. Rather, it organizes a rally to picket alongside that teacher and makes sure that her family has access to food and basic needs. A community of care recognizes when a member becomes detached and starts displaying the warning signs of fatigue or depression, and it intervenes with a shoulder to cry on and a safe space to be vulnerable. When a community of care does its job properly, deeper connections and clearer purposes emerge. A strong community of care makes sure nobody goes it alone. How Do We Build Sustainable Communities of Care? A powerful community of care doesn’t require a massive membership. Go ahead and start on a smaller scale. Find a friend or two who share your sensibilities and start a self-care practice together. You and your micro-community buddies can schedule regular check-ins; invite each other to self-care activities; and set realistic goals together (You can join our online meditation group and spend 30 minutes every Friday with a global group of like-minded people, for example). Most importantly, you’ll enjoy the empowering support and motivational accountability that come with finding a true sense of community. Once you have a small group formed you can look for more people who share your values to build out your community. Identifying these people is actually the easy part. They’re people involved in causes near and dear to your heart. They’re your neighbors who are facing the same challenges you face. The hard part is having the courage to approach them. It’s kind of like asking someone on a date. There’s always a little healthy trepidation at first, but you just have to go for it. The ask doesn’t have to be formal—it can start as a group email or text message thread that leans into your vulnerability. 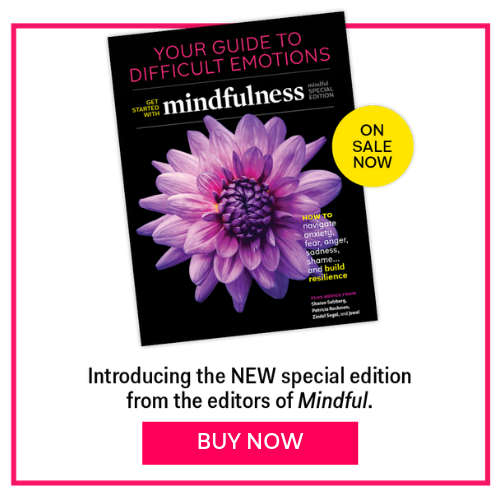 I once sent a text message to two friends and a coworker that said, “Ladies, I need your help, I’m feeling depleted and I need some of your time, and attention and to ask that you hold me accountable to make some changes.” What I found was that first, there was this willingness to come to my aide and secondly, when I expressed my struggles there was a willingness from my friends to ask for help themselves. Once you break the ice and get people on board, begin by sharing your viewpoints, personal strengths, and intentions for the group. After our first gathering, we took an inventory of our life and examined each area where we felt lacking, we each committed to one or two things we could take on to make improvements, we asked each other make sure we were held accountable, and we decided that we enjoyed it so much that we wanted to meet again. You can make your group more formal if you want to by defining the mission and then inviting people to join the group if the mission resonates. This can be in the form of an email, evite, or Facebook event, for example. Set a time and date, define your goals and see who shows up. You may be surprised. The point is to foster a group dynamic that’s a true give-and-take between like-minded people who share the same values, intentions and ultimate goals. In the struggle for self-care, we often fail to remember the seemingly immovable root of the struggle in the first place. We ignore the elephant in the room: the institutional, economic and structural influences that prevent our wellness: the cruel side of capitalism, the American obsession with “busyness”, and the incessant influence of social media, to name a few. Ironically, it’s those failing institutional, cultural, and structural influences that lead many of us to activism (as well as the need for getting serious about self-care). Whether it’s fighting for affordable or universal healthcare, quality education in low-income areas, affordable public college tuition, humane immigration policies, or any other cause near and dear to your heart. Only by working together, from a place of clarity and strength, can we build a conscious path out of our collective quagmire—One day at a time, one foot in front of another, lifting each other up along the way when we inevitably fall down. Finding (or founding) a community of care has never been more important—Your self-care tribe can have a tremendous impact on how you handle challenges, how quickly you bounce back, and how well prepared you are to recognize issues and engage in proper self-care. Without the support of a community filled with people you trust and led by values you hold dear, you might find yourself pouring from an empty cup. Burnout, compassion fatigue, depression, anxiety, and secondary trauma are all major risks of an involved life these days. It’s up to us to take an active role in creating the communities of care and support we need in the world.